Could a outer Circle Route work? No not to that extent. Not to Mandurah and Armadale. Freo-Cockburn-Cannington-Bassandeen-Morley-Mirabooka-Whitfords-Cottesloe-Freo could possibly work but I think a inner circle is more needed and the resources are better used for other things anyway. Transperth and now German and Austrian Trains!!! I once had my own idea/thought of an outer circle. From Fremantle being base, via Murdoch, Thornlie, Cannington, Perth Airport, Bayswater, Morley, Mirrabooka, Warwick, Karrinyup, Scarborough, City Beach, Cottesloe to Fremantle. There are really a lot of things to consider though and it does have hits pros, but it also has its cons. The route would follow some of the current circle as well as reaching more outer from the current circle route. As for an inner circle, with the landscape and setting of Perth, it'd be difficult for one without avoiding the city and it's chaos. I'd much rather that Knowledge Arch light rail proposal from UWA to Curtin via Perth and Victoria Park. 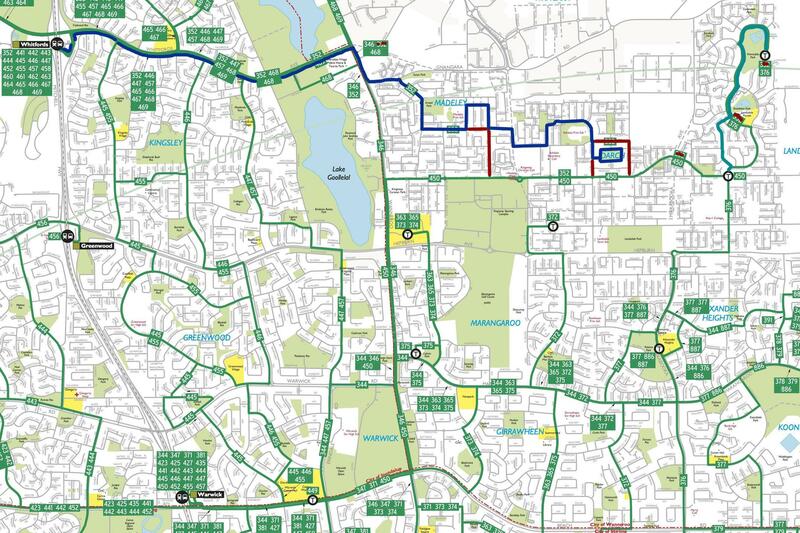 After having a closer look, I like the idea of Darch modification, however my idea would be to combine the 372 and your proposed 452/352 together and run the service from Mirrabooka to Whitfords via Darch, not only providing another crosstown link, but also giving more options for residents in between. I'd then extend the 450 to Warrahdale Tce, however via the opposite end so 90% of the time, buses do not need to chuck a u-turn. Then basically the 450 and 376 can operate combined so that a 376F would change into a 450T etc.... Then give both routes to one operator, probably Path as the focus of this is on Landsdale which lies within Path's boundary. It would use resources more efficiency having it with the one operator. If it wasn't for the fact Greenwood wasn't designed as a bus interchange, I'd have all buses extend from Kingsway, but because they're not, this is my idea, to extend the 365 from Kingsway to Greenwood and replace that 451. It'd make better use of what may end up as a not so utilized route. Being able to operate a service even without anyone on most of the time is better than any sort of dead running. wayfarer wrote: Have 111's running all day T and F .. the 106 really picks up most of it's clientele in the freo-melville-applecross area to justify it anyway. Well my salve is it's purely for selfish reasons too.. Would save me from having to catch a 881/940/160 etc . from the busport and then change off at canning bridge to a soon-to-arrive 106 that probably saves me 15-20 minutes on a good day to get home to East Freo. Agreed! Would alleviate pressure from the train and provide a lengthier duration of convenience - perfect for attracting and retaining new and existing passengers. Amazing, relatively, what is considered a failure on a bus as opposed to a train. Only 300 people used the 0400 Friday train over all lines, an average of 50-60 on each line....HARDLY A FAILURE! How many services run around the city and suburbs with less than 10 passengers at any given time between 1900 and 2400 hrs on a daily basis? And why not charge for it to help make it more viable? I don't believe it is unreasonable when you consider the alternative is an expensive taxi fare (flag fall alone more expensive than a train ticket). Drive past the Murray St entrance to Perth Underground (and Esplanade) and see how many stragglers are waiting for the gates to open for the first train to Mandurah. There are a lot so it is justified and should come under the CSO that currently provides services outside "peak" conditions. Adelaide, smaller than Perth, has a better all-night service. I simply think that trains should run at 0100, 0200, 0300, 0400 & 0500, and in BOTH directions. Buswell's weak answer that they are trying to get people out of the city and not in is simply BS. People live in the city or near to it as well and need to return from Fremantle etc. We are really so backward with public transport in this place. We are "booming" at a net migration rate of around 800-1000 people per week and Transperth don't want to get their trains dirty. The issue with running the 450 east is that the population of Landsdale is generally shifted to the west but I could imagine the service continuing along Warrahdale Tce, then turning left into The Broadview before joining the route to Warwick/Mirabooka again. The 376 Could run clock-wise and the 450 anti-clockwise. The times would have to be changed to a max. 3 Minute break at the terminus where the PAX stay seated (Like the BLUE CAT at the Busport). I personally believe there is still a need for the 451 to be extended east of Kingsway to serve the growing communities between Hepburn Ave and Kingsway and the proposed development (s) east of Landsdale. I agree that the decision to make Greenwood a pure train station was a BIG mistake but when looking at near map I can see how easy it would be to convert the loop into a bus interchange by simply moving the 9am Bays (14) to the first row of standard parking (16 bays). I am sure that 16 commuters will prefer to catch a bus instead of take the car if they don't have to travel all the way to Warwick. On weekends, half the PAX on the 456 are often Sorrento and Duncraig residents. I'll draw up some plans and post them later. Start with a stop outside Leederville Station on Southport Street, then down Southport, Railway Parade, Sunderland Street through the Subway, Wellington Street, Havelock Street, Kings Park Road, Malcolm Street, St Georges Terrace, Mill Street to Esplanade Station. Then the same again in reverse back to Leederville. Anyone else want to suggest where this new Green CAT could/should run? Finally someone has figured out that Leederville is closer to West Perth then congested PUG. And will Joondalup trains stop all stations in a years time, because only Glendalough, Striling, Warwick and Whitfords are linked to Leederville in Peak at the moment. plant-ender wrote: I simply think that trains should run at 0100, 0200, 0300, 0400 & 0500, and in BOTH directions. Buswell's weak answer that they are trying to get people out of the city and not in is simply BS. People live in the city or near to it as well and need to return from Fremantle etc. Yes, I agree, we need to see a de-centralisation of train and bus services. Not everyone travels to/from the city at a given time. Cat wrote: The Worst Australian has it looping round the waterfront and up Barrack Street. Surely, Gillard would have nothing to do with this arrangement? There was actually a map with the new plan on Ch 7 News, hopefully someone may have captured that, or at least the map may be available later. I'm interested as to where the extra buses will come from for the extra Red CAT services starting in July. plant-ender wrote: Amazing, relatively, what is considered a failure on a bus as opposed to a train. Only 300 people used the 0400 Friday train over all lines, an average of 50-60 on each line....HARDLY A FAILURE! In regards to the Green Cat. Im also interested to see what buses will be put on that seeing most of SCT SWB OC's are already at Claisebrook Depot. Turns out there'll be three extra buses for the Red CAT this July. Plenty of choices seeing as though several OC's were taken out of route service and turned into cats last time, nothing stopping them just doing the same thing to 3 more eh? ADX666 wrote: Plenty of choices seeing as though several OC's were taken out of route service and turned into cats last time, nothing stopping them just doing the same thing to 3 more eh? My guess is 1919 and maybe some common sense will prevail and they'll grab something like 1908 and 09 and use these solely for the Yellows, which have no issues with tight turns. PT Masterplan 2031 wrote: an inner “circle route” is needed in the long term to link Glendalough on the Joondalup line with Canning Bridge on the Mandurah line, and Subiaco and UWA/QE11 before entering the City from the east via Curtin/Bentley at Victoria Park. I've seen artic's on 4's and the Yellow should be fine in LWB's too. Isn't that what it already does?